Some of you might have been tracking my recent trip to Aigle in Switzerland for a week of suffering at the UCI’s World Cycling Centre. Singapore Airlines’ crazy pricing structure meant it was over $1000 cheaper if I arrived there few days earlier. Definitely, they didn’t hear me complain, as I got a few days riding the stunning valleys and mountains that surround Aigle. The name Aigle, means Eagle. It is a small town of less than 10,000 people surrounded by the amazing beauty of the Swiss Alps. Every where my eyes looked, it see the endless iconic climbs that have starred in major tours like Tour de France, Tour de Suisse and Tour of Romandie. On the Friday before the camp, I decided to take on the ambitious route from Aigle over the mountains into France. With bold ambitions to climb Avoriaz, a monster climb with a summit 1800 metres above sea level. That morning, I needed to assemble the bike after the flight. Fortunately, I traveled with Scicon Aerocomfort 2, which means I can leave behind my bars and seat when packing. Luckily, I had also installed the Swiss maps on my Garmin, in the hopes that I could avoid getting lost. Setting down the Rhone Valley, I was constantly reminded that I was a thousand miles away from Singapore. Mountainous peaks and vineyards surrounded me. It blew my mind to be riding in such a beautiful setting. 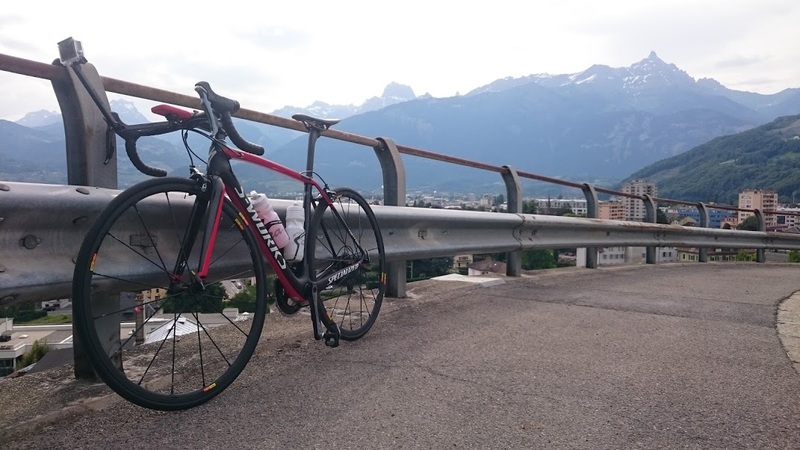 The first climb was a 1000 meter ascent out of Monthey up into the Morgins. A 15 kilometer grind with an average grade of 8%. Welcome to Switzerland, Scott. That’s me on the climb in the feature image for this post. The initial part of the ascent was stunning switchbacks out of Monthey, but was soon replaced by the long climb into the Swiss ski resort of Morgins, before crossing the border over into France. Now, I was expecting some form of border control, so I rode with my passport. 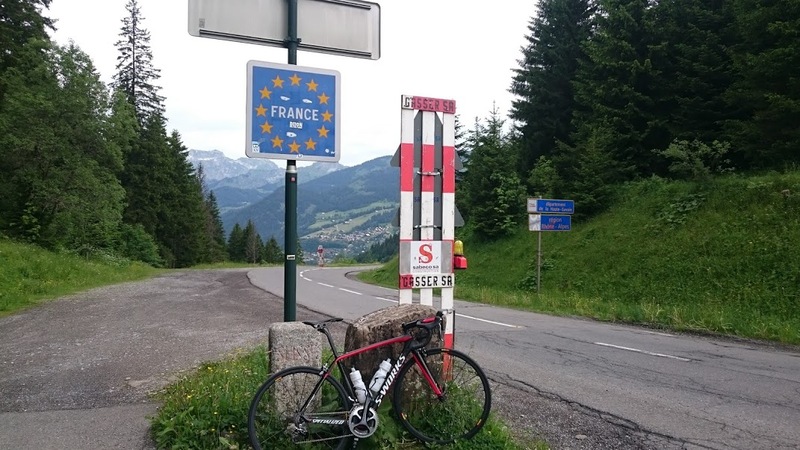 Imagine my surprise when all I found was a small sign at the crest of a climb before descending into the French ski village of Chatel, a location famous for Team Sky’s pre Tour de France training camps. I was hopeful of passing by Richie Porte while training, but I wasn’t so lucky. Instead I had a nice 20 kilometre coast through the French valley. Next on the menu was the Col du Corbier, a French Alpine Pass located in Haute-Savoie department in the Rhône-Alpes region in Southeastern France between the towns of Le Biot and Bonnevaux. It was a little less imposing than the previous climb, although the summit was still 1230 meters above sea level with an average grade of 8%. I got an early ego boost when I passed by a couple of riders on the climb. It seems my Singaporean legs had some climbing strength in them. Although on the descent, I started to realize the size of the challenge I’d attempted. A huge 160km ride with not one, not two, but five massive climbs on the ‘out and back’ journey to Avoriaz. I was going to need more fuel. The following 15 kilometers after the summit took me into the town of Morzine where I met my next challenge. I was in France and I had only packed Swiss Franc and my American Express; two forms of payment that are rarely accepted in France, especially up in the Alps. After disappointing one store owner with my Amex card, I found a Cornwell Pub, complete with Cornwell Pasties and Guinness on tap, who luckily took Amex. 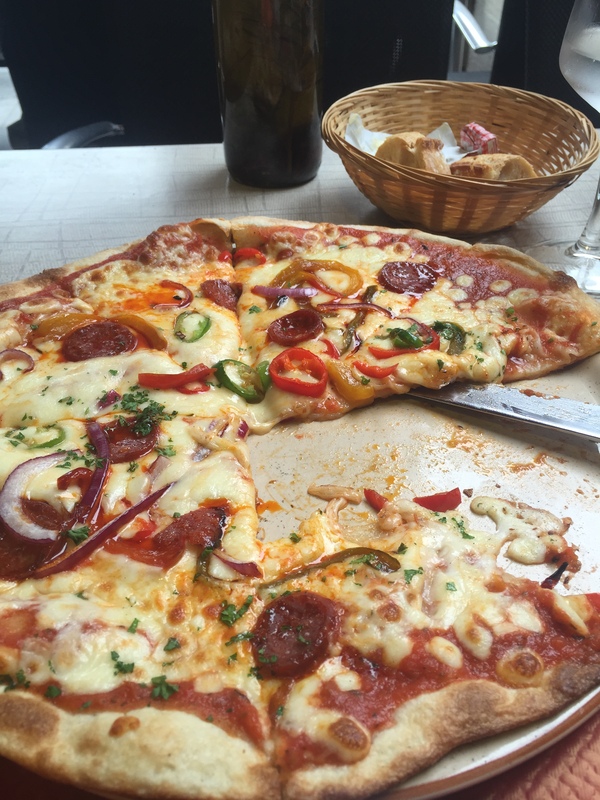 My choice, the European Pizza loaded with spicy chorizo, espresso, and sparkling water. Loaded with fuel, I look up the crazy ascent of Avoraiz, which was featured in Stage 8 of the 2010 Tour de France. The climb features a 14km distance and a 900 meter ascend at an average grade of 6%, but many sections were over 11%. The climb looked cold, which I wasn’t fully prepared for. I had arm warmers, but I am going to need something more. Plus, I am now running out of time, I needed to be back in Aigle by 6pm to meet the others for dinner. Fortunately, the heavens opened up just as I was saddling. It didn’t take me long to opt out of the climb and certain frozen descent. Instead, I rode the path back to Aigle, which included the ascent back up the Col du Corbier, and the climb back into Switzerland. By the time I got back to Morgins, I was in need of energy, something a Coke could fix before accelerating down the switchback descent into Monthey. For the final 15 kilometers, I was just happy to have a flat ground to ride. While I chickened out of the biggest climb of the day, I still managed 140km and over 2700 meters of ascents on four out of the planned five climbs. In Singapore I’d be lucky to accumulate that amount of climbing in a month. It was an epic welcome to the region, and had me buzzing for the training camp that lay ahead of me.